Friday, November 11, is Veterans Day, in salute to this country's fighting forces (or, to D.C. politicians who send them abroad to die or get maimed, Friday, November 11, is...Friday. Party time with the mistress!). The CWRU community is marking the occasion by showing Steven Spielberg's 1998 war drama SAVING PRIVATE RYAN, I suppose either in the spirit of civic-mindedness or in recognition that after graduation just about the only jobs available for University Circle youth is military service as cannon fodder in the next oil war, under President Schwarzenegger/Cain/Romney/Cheney/Limbaugh/Jeb Bush/whoever. Operation Iran, Venezuela or Kuwaiti Freedom, anybody? If so, here's a preview of post-grad life for the Class of 2012. SAVING PRIVATE RYAN is Steven Spielberg's most violent film, especially in the opening 25-minute D-Day invasion massacres. No sugar-coating, no "cah-toon violence," no nameless, inconsequential casualties like LucasFilm Imperial Stormtroopers or Starfleet guys in red shirts. This is unsparing ugly and dirty combat, meant to make even the Xbox-hardened viewer appreciate the vicious human cost and tragic sacrifice of the Allied beachhead - mostly by young men who were barely more than boys. It's a master filmmaker's true-life recreation of one of the bloodiest battles in human history. After the initial invasion carnage dies down, the plot begins in earnest. Well-liked Capt. John Miller (Tom Hanks), commander of one squad (and who, in civilian life, turns out to be a teacher, not a military careerist) receives unexpected orders to go deep into the battle lines to locate and retrieve one Private James Ryan (Matt Damon), whose brothers have all been killed in action. US Army brass has thus decided, as a mercy, that Ryan's family has paid enough of a high price and deserve one son be sent home to them safe and alive. But this noble goal puts the entire squad (big-name actors such as Barry Pepper, Tom Sizemore, Vin Diesel, Giovanni Ribisi etc. not doing any grandstanding and taking this all as seriously as Spielberg) at risk, and similar would-be acts of compassion have drastic outcomes during the fog of war. 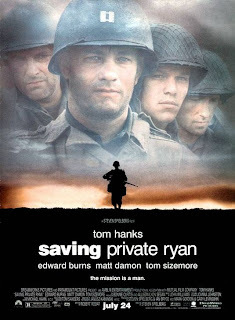 I confess, I came to SAVING PRIVATE RYAN on video well after its release - and after a Catholic priest already ruined the tragic and ironic twist ending for me in his sermon (memo to the Vatican: If you don't want church attendance to fall any further than it already has, brief all clerics on the meaning of "spoiler alert"). Had I been among the early viewers in theaters this narrative might have impacted me as strongly as SCHINDLER'S LIST. That is saying a lot right there.